Arms of Eugenio Card. 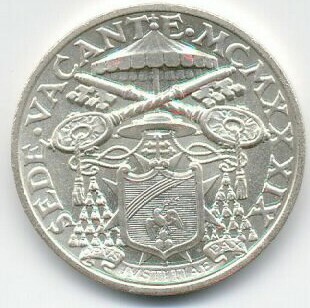 Pacelli, Camerlengo of the Holy Roman Church (1935-1939), surmounted by his Cardinal's hat, with fifteen tassels on each side; his motto OPVS IUSTITIAE PAX (Isaiah 32. 17) on a ribbon below; crossed keys joined by tasseled cord, above; the Ombrellone above all. 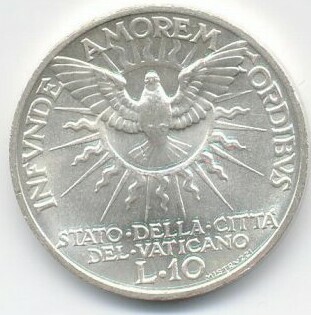 The Holy Spirit, surrounded by rays of light and tongues of fire. 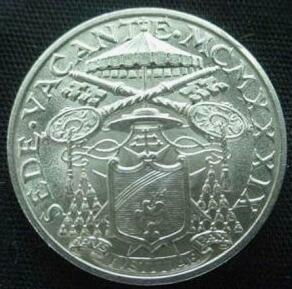 Arms of Eugenio Card. 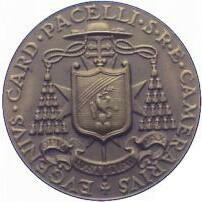 Pacelli, Camerlengo of the Holy Roman Church (1935-1939), surmounted by his Cardinal's hat, with fifteen tassels on each side; his motto OPVS IUSTITIAE PAX (Isaiah 32, 17) on a ribbon below; crossed keys joined by tasseled cord, above; the Ombrellone above all. Keys of St. Peter, crossed on the pole of the Ombrellone, joined by a cord. The Arms of Eugenio Cardinal Pacelli upon an archepiscopal cross and the Cross of the Knights of Malta, surmounted by a Cardinal's galero with fifteen tassels on each side. EUGENIO CARDINAL PACELLI (1876-1958), born in Rome of a family of Vatican functionaries, attended the Gregorian University, the Capranica College, and the Academy of Noble Ecclesiastics, though with a dispensation throughout to live at home. He was ordained a priest in 1899, and entered papal service in 1901. He was an assistant to his patron, Msgr. Pietro Gasparri (who became a cardinal in 1907, and Secretary of State in 1914) from 1904-1917 in the project for the recodification of Canon Law. In 1917 he was named Nuncio to Bavaria by Pope Benedict XV, and consecrated Archbishop of Sardis; in 1920 he was named Nuncio to the new Weimar Republic. 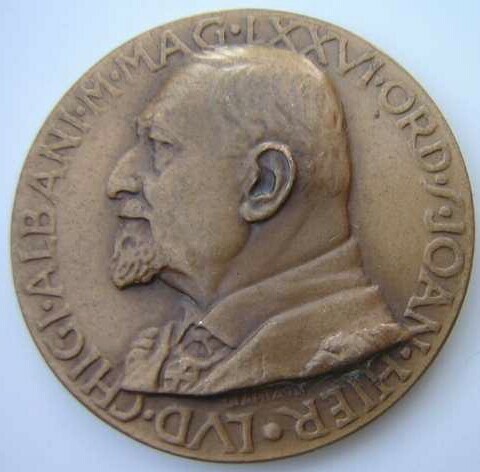 He was appointed Cardinal on December 16, 1929, and succeeded Cardinal Gasparri as Secretary of State on February 7, 1930. Having long and unsuccessfully sought a concordat with the Weimar Republic, he conducted negotiations at long distance through intermediaries with Nazi Germany for the Concordat of 1933. He became Cardinal Camerlengo of the Holy Roman Church in 1935, in succession to his patron, Cardinal Gasparri. Never having had a 'cure of souls', never having been a parish priest, never having administered a diocese, he was elected pope on March 2, 1939. 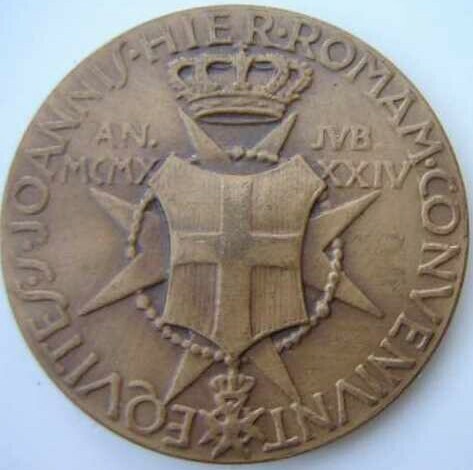 Prince Ludovico Chigi Albano della Rovere (July 10, 1866–November 14, 1951), son of Prince Mario and Antoinette, Princess zu Sayn-Wittgenstein-Sayn, was 76th Grand Master of the Sovereign and Military Order of the Knights Hospitaller of St. John on Jerusalem (Knights of Malta) from 1931-1951. In 1893 he married Donna Anna Aldobrandini, Princess of Sarsina; they had three children, Sigismondo, Pietro and Laura. Prince Ludovico was Marshal of both the conclave of 1922 and that of 1939. Bust, l., of Prince Ludovico Chigi Albani, 76th Grand Master of the Knights of Saint John of Jerusalem. The Arms of Prince Ludovico Chigi, Grand Master of Knights of Malta, surrounded by the collar of the Grand Master, surmounted by a princely coronet. Assembly of the Knights at Rome, 1934. There were only ten cardinals from the Conclave of 1922 who were still living, three Cardinal Bishops and seven Cardinal Priests. 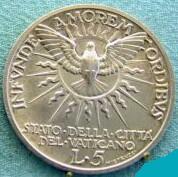 Thirty-five of the cardinals were Italian (56.45%). The average age was 66.30. Francesco Marchetti Selvaggiani,(aged 67), Bishop of Frascati (died January 13, 1951). Vicar-General of the City of Rome. Archpriest of the Lateran Basilica. 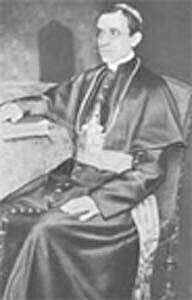 Angelo Maria Dolci (aged 71), Bishop of Palestrina (died September 13, 1939). Archpriest of the Liberian Basilica (S. Maria Maggiore). Alessandro Verde (aged 73), Cardinal Priest of S. Maria in Cosmedin (died March 29, 1958). Enrico Sibilia (aged 77), Cardinal Priest of S. Maria Nuova (died August 4, 1948). Francesco Marmaggi (aged 68), Cardinal Priest of S. Cecilia (died November 3, 1949). Carlo Cremonesi (aged 72), Cardinal Priest of S. Lorenzo in Lucina (died November 25, 1943). Henri-Marie-Alfred Baudrillart, Orat. (aged 80), Cardinal-Priest of S. Bernardo alle Terme (died May 19, 1942). Ermenegildo Pellegrinetti (aged 62), Cardinal Priest of S. Lorenzo in Panisperna (died March 29, 1943). Giuseppe Pizzardo (aged 61), Cardinal Priest of S. Maria in Via Lata (died August 1, 1970). Camillo Caccia Dominioni (aged 62), Cardinal Deacon of S. Maria in Domnica (died November 12, 1946). Nicola Canali (aged 64), Cardinal Deacon of S. Nicola in Carcere (died August 3, 1961). Federico Cattani Amadori (aged 82), Cardinal Deacon of S. Maria in Aquiro (died April 11, 1943). Massimo Massimi (aged 61), Cardinal Deacon of S. Maria in Portico (died March 6, 1944). President of the Pontifical Commission for the Codification of Oriental Canon Law. 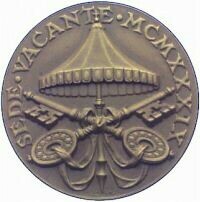 The Conclave of 1939 began on March 2. Cardinal Pacelli, the Camerlengo and Secretary of State of Pius XI, was elected Pope Pius XII on the first day, on the third ballot (March 2, 1939). He died in Rome on October 9, 1958.